DKSH, a leading Market Expansion Services provider, donated a sixteen-seater Mahindra Excelo school bus to Swami Brahmanand Pratishthan, a center for children with special needs. With this donation, DKSH emphasizes its support for local communities and helps to create a safe travel environment for the children at their Seabird center in Uran, in the Raigad district of India. 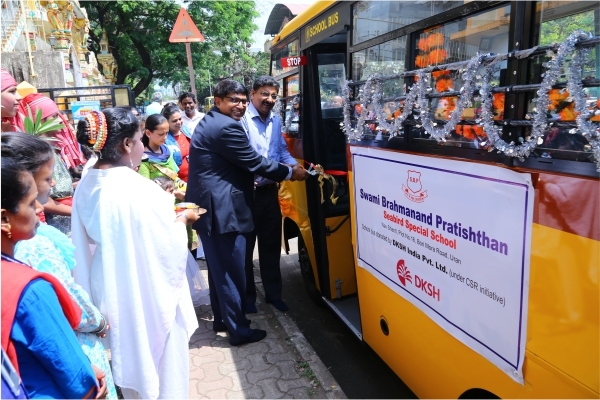 Mumbai, India, May 4, 2018 – DKSH, the leading Market Expansion Services provider with a focus on Asia, has supported the Swami Brahmanand Pratishthan center by donating a sixteen-seater Mahindra Excelo school bus as well as toys and play equipment to the pre-primary children with special needs. DKSH is deeply rooted in the communities it serves and strives to create positive impacts beyond business activities. Through different sustainability projects in Asian countries the company creates opportunities for development across society. Atul Nagarkar, Managing Director, DKSH India and guest of honor Mr. Manoj Shetty, Business Team Director, Asia, Wacker Silicones, inaugurated the new school bus along with DKSH India employees, children, teachers, trustees and the principal of Swami Brahmanand Pratishthan. After the inauguration event, the team greeted all the children and participated in a cultural program that was organized by the school committee. The activities encouraged the children to showcase their talents. “We are immensely thankful to DKSH for donating the school bus which has brought cheer and joy in the lives of the children with special needs and their families. This support means a lot to our institute”, stated Shirish Poojari, Founder of Seabird Centre, Swami Brahmanand Pratishthan. Swami Brahmanand Pratishthan is a voluntary organization run by trustees, working towards the upliftment of persons with intellectual and developmental disabilities by providing quality service to each special child. From a humble start in the Shahabaj village in 1990 with just three students and classes conducted in the Shahabaj Vyam Mandir, today, Swami Brahmanand Pratishthan has well-equipped set-ups for the special children at four different locations. Currently the institute is catering to 165 students. DKSH Business Unit Performance Materials is a leading specialty chemicals distributor and provider of Market Expansion Services for performance materials, covering Europe, North America and the whole of Asia. The Business Unit sources, develops, markets and distributes a wide range of specialty chemicals and ingredients for pharmaceutical, personal care, food & beverage as well as various industrial applications. In addition, it creates innovative and cutting-edge concepts and applications in 29 innovation centers located worldwide. With 100 business locations in 31 countries and around 1,010 specialized staff, Business Unit Performance Materials generated net sales of CHF 894.1 million in 2017.